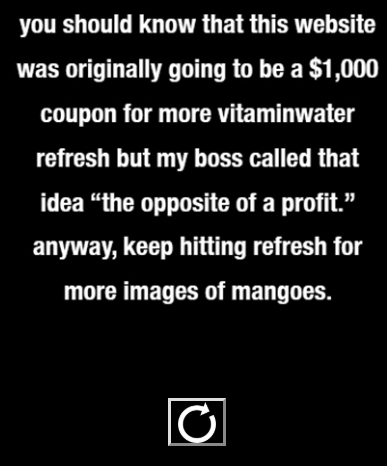 I saw this link on my bottle of Refresh Vitaminwater and thought it was a joke. "©2018 glaceau. vitaminwater refresh does not contain any mango juice"
That screenshot is of one of the jokes. There are fun images of mangoes in picturesque locations which would make great desktops, except they aren't sharable or saveable.